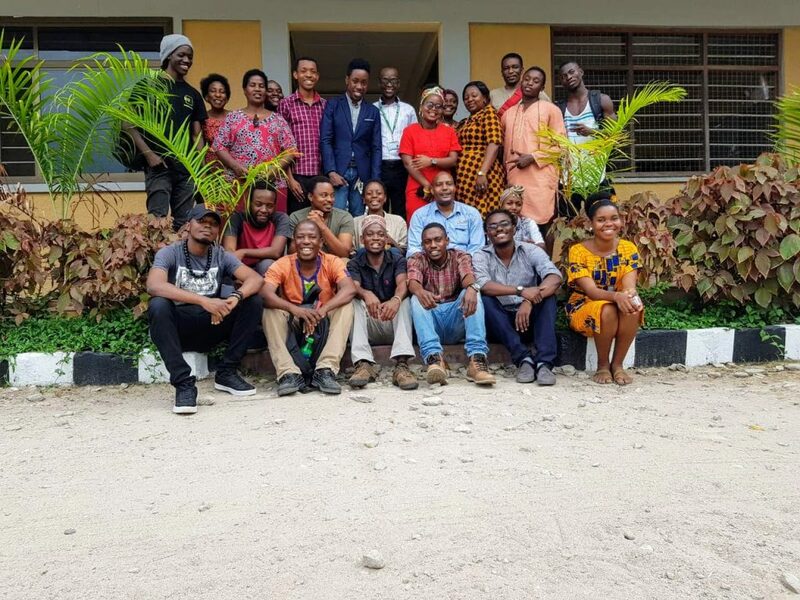 At around the half-way stage of Sanaa Yetu, our Art-reaches, established as way of sharing art and symbolizing Nafasi’s collective spirit, had proved to be the most challenging and fulfilling of all our activities. 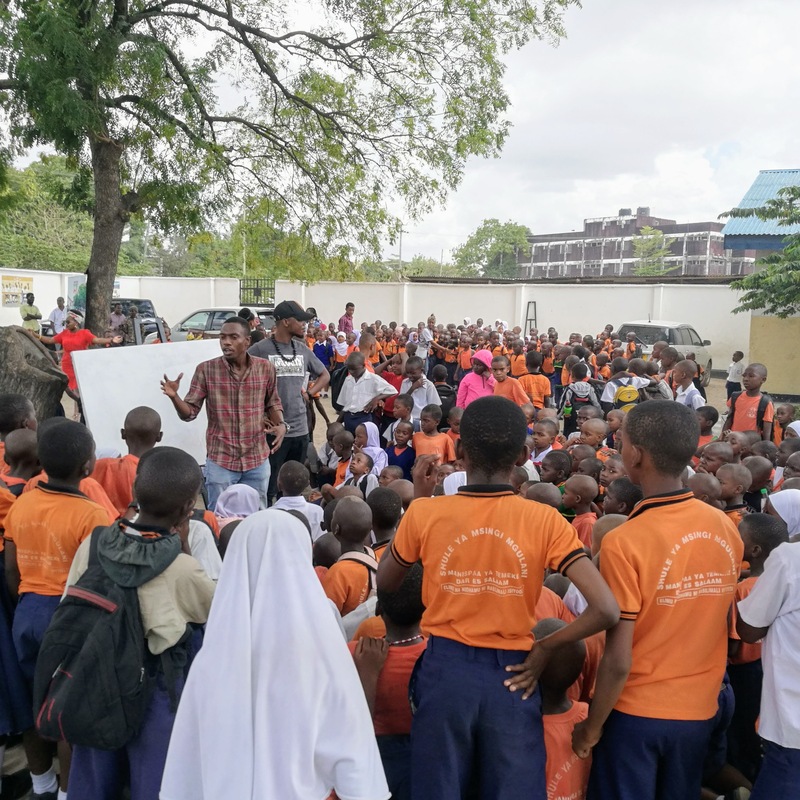 And the second half our schedule had three more, at Muhimbili Hospital, and Mgulani and Chang’ombe primary schools, before our return to Nafasi for the climactic Sanaa Yetu Festival. In prospect, the remaining three Art-reaches would each follow a similar pattern: the effort would at first be intensely focused on logistics—permits, staff, materials, transport—and then gradually, even reluctantly, on the timing and running order for each given day. It was easy to focus on the tangibles, review the numbers, the stock, the equipment–over prepare out of the common worry amid such events that maybe things might not quite come together. Always, each event, on paper, resembled an act of faith. 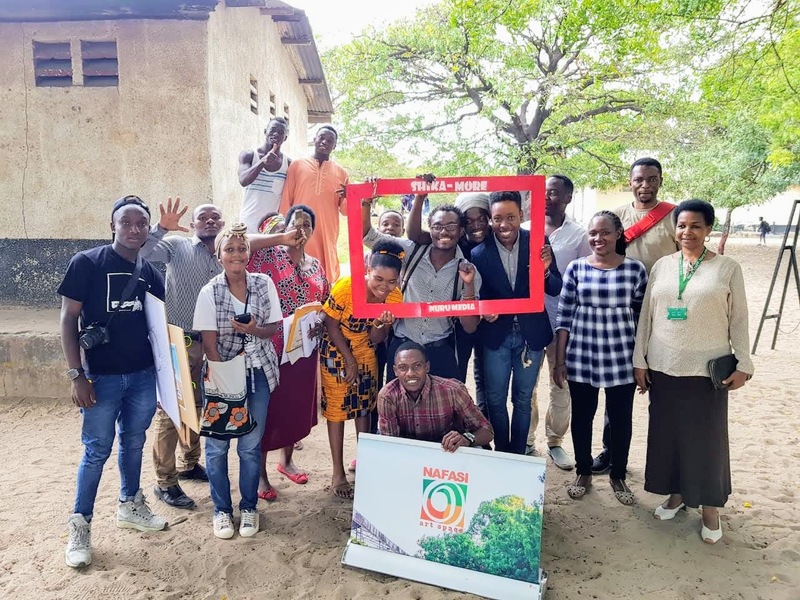 We were helped in this respect by the partners we had in each place, most notably at Muhimbili hospital were we would be working with Tumaini La Maisha, an organization in charge of housing, care, and general well being of Children undergoing cancer treatment at Muhumbili. TLM had hosted their fundraiser at Nafasi a month earlier and our familiarity with the management and children made our outreach at Muhimbili on the 22th of September easy to plan and fun to execute. 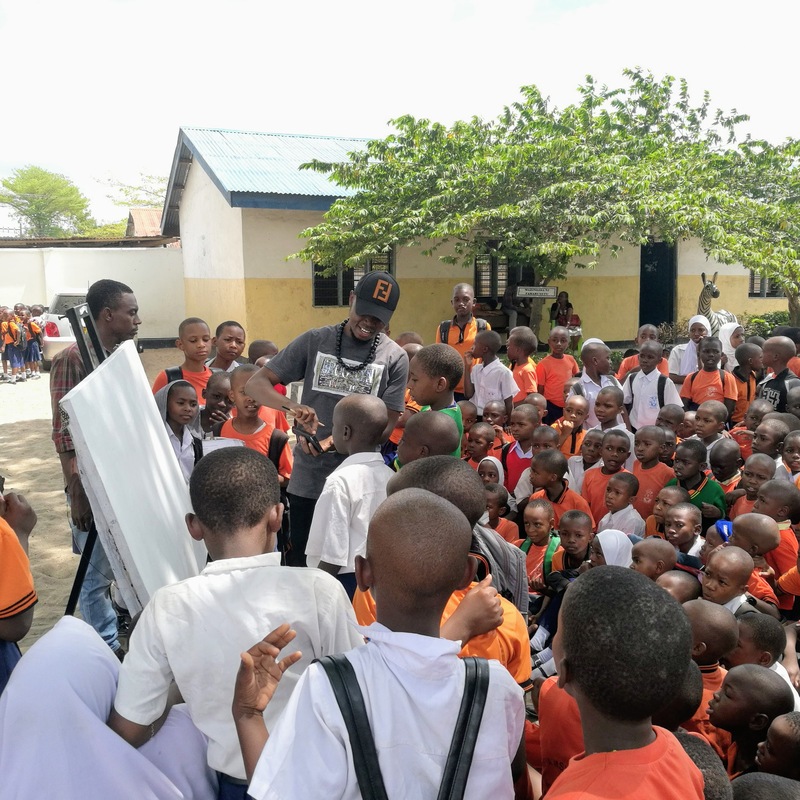 We were welcomed at Ujasiri, a two floor building with classrooms, bed rooms and play spaces that serves as base for Tumaini and provides lodging for some of the children and their parents. 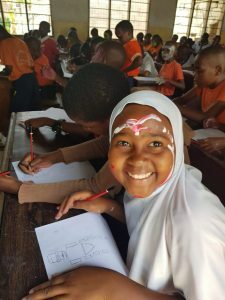 We arrived to Ujasiri early with canvasses, crayons, paint and paper plates and set up in a narrow courtyard between a classroom and a small building at the back. 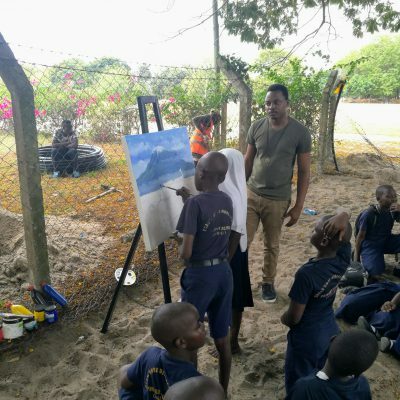 Our group was led by artist Fred Halla, whose varied art career involving stints as a marketer, cartoonist, painter, and teacher has rooted him in a love of knowledge. His simple, engaging activity involving making turtles out of glue, color and paper plates, served as a kind of anchor and around the satisfied hum of those he gathered musician John Kitime found a corner to strum his guitar, while Mwamdale and Safina, sculptors of wood and metal respectively, settled for something more perishable by handing out papers and conducting a coloring exercise. 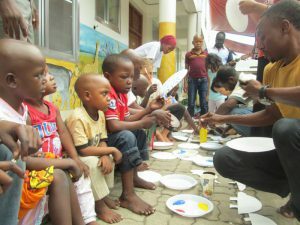 For those still on edges there was also a water tank to paint and mural activities run by Dullah Wise. 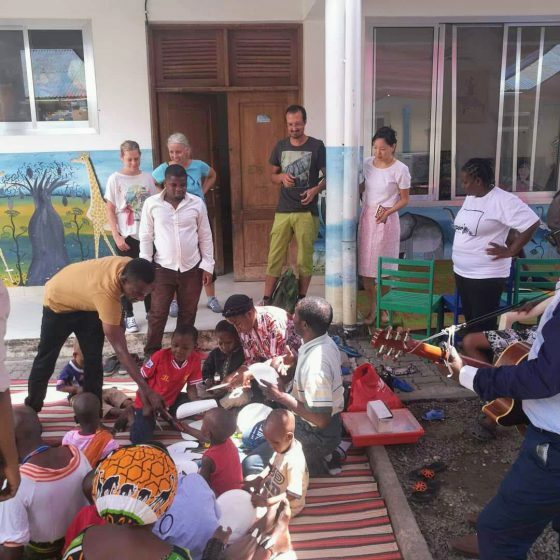 The half day of activities seem to end as soon they began and we were soon packing up and on our way, grateful to have come, and grateful again for for our growing friendship with children and management of Tumaini La Maisha Muhimbili. Following Muhimbili we had entered our last week of events. 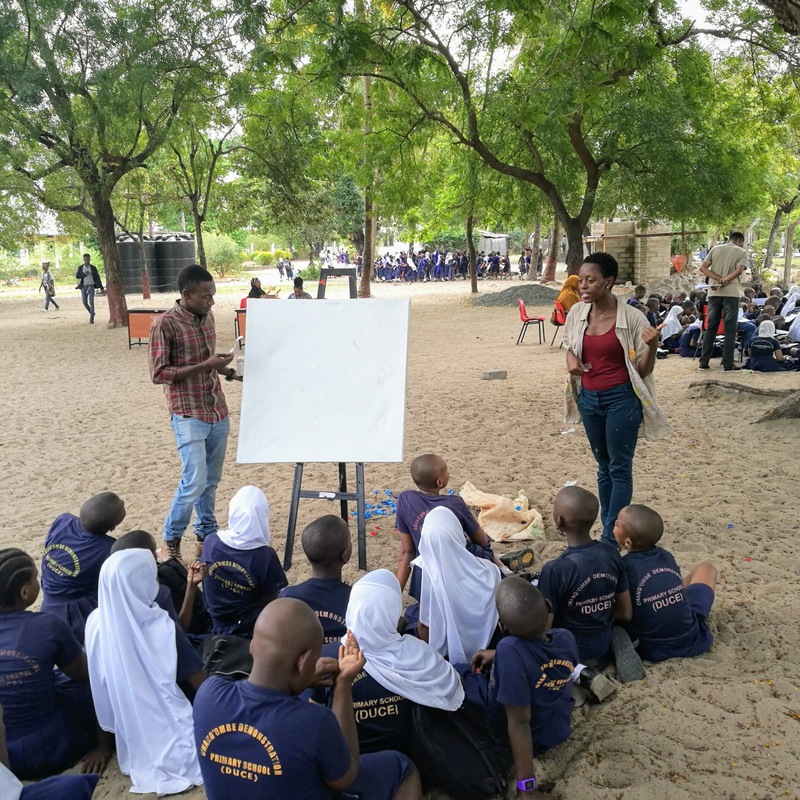 There were only two outreaches remaining, at Mgulani and Chang’ombe primary schools, both of which were due to take place on September 26th. It was arguably our most ambitious undertaking. We expecting over 1000 students at Mgulani and a further 400 at Mgulani. There was certain to be excitement; the challenge would be channeling it into something more sustained and engaging. 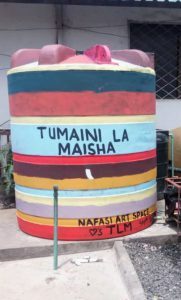 The participating artists were a microcosm of Nafasi’s multi-disciplinary philosophy. 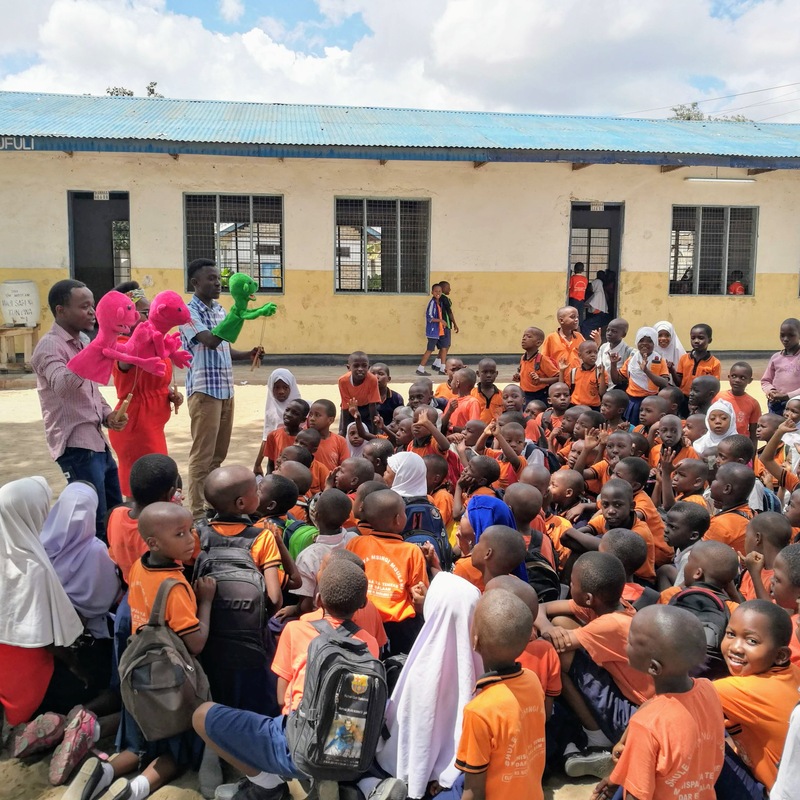 There was a Adbdullah Mambia and the team from Nuru Media among whose various media-led pursuits was a puppet show for young learners. 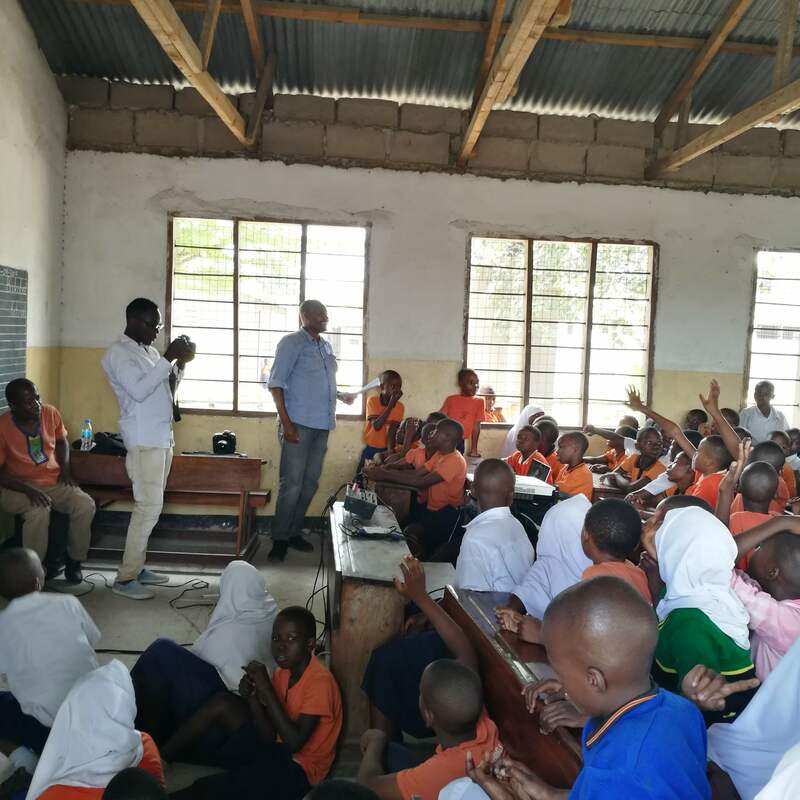 Richard Magumba, a filmmaker keen to share a couple informative, award winning short films with the older students. 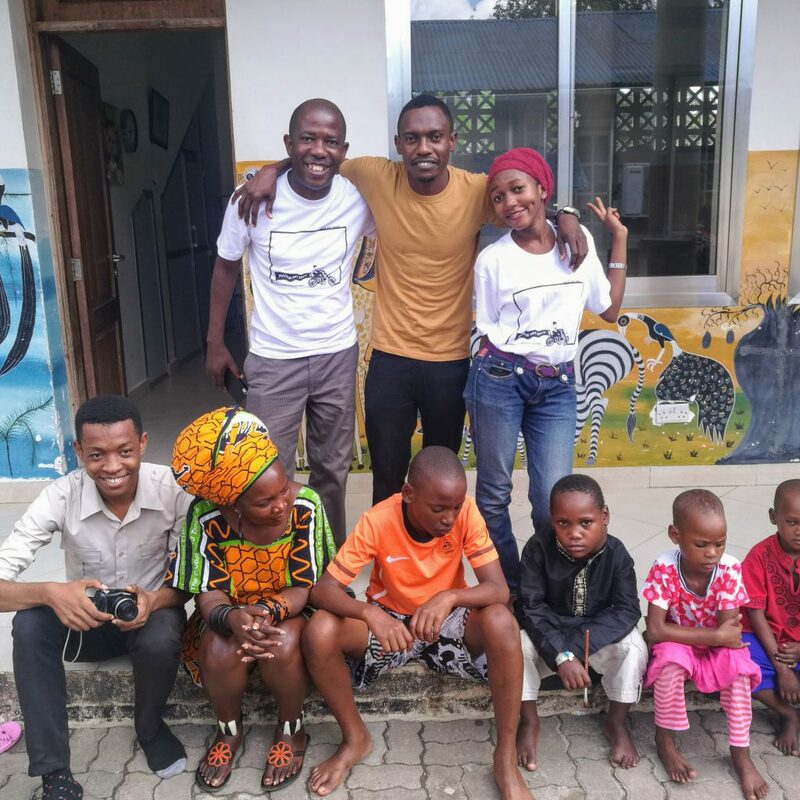 Samuel Japhet of the Nantea Dance company, and three painters, Thobias Minzi, Dullah Wise and Masoud Kibwana. We arrived early, eager to make the most of our time in each place. The team spread across the narrow, sandy grounds at Mgulani to set up stations for each activity. The students, each dressed in orange and blue, filed out slowly, expectantly under the direction of their teachers. 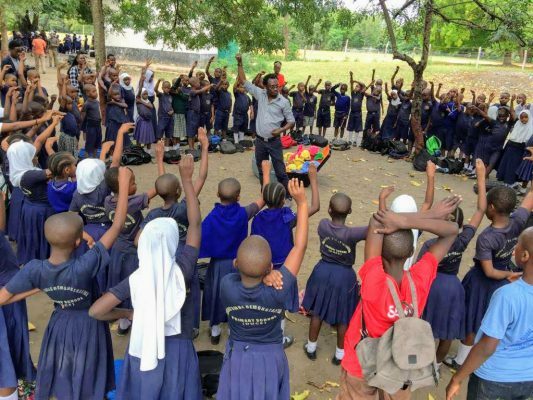 They were directed towards their respective activities with the youngest going furthest—led to a corner of the ground where Nuru’s multi-colored puppets were gradually unfurled. 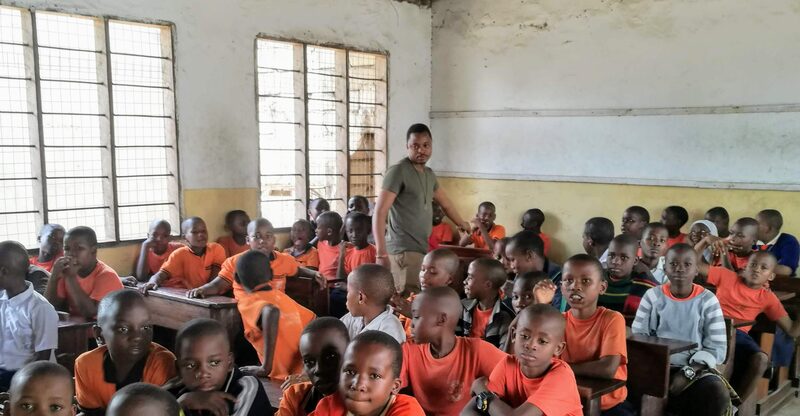 The group, comprised of students from year 1 to 3 where the first to start, and their songs and laughter were the background to the remaining students, as older students followed one of Masoud or Richard in a classroom where there would either watch a film or take part in a sketch masterclass. 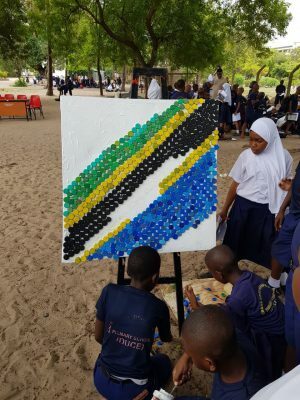 Of those still outside the most energetic joined a dance activity led by Nantea while the more studious answered quiz questions about Tanzania in front a blank canvas where they would soon paint the flag under the guidance of Dullah and Minzi. 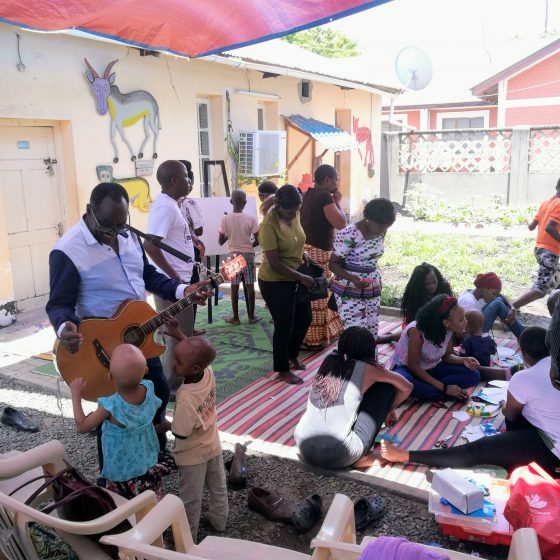 With each and every student occupied a kind of carnival took hold, a mood and atmosphere of inspiration where songs the students knew bubbled up and died away spontaneously, inspiring and inspired by excitement, laughter and learning; by art’s insistence of feeling. 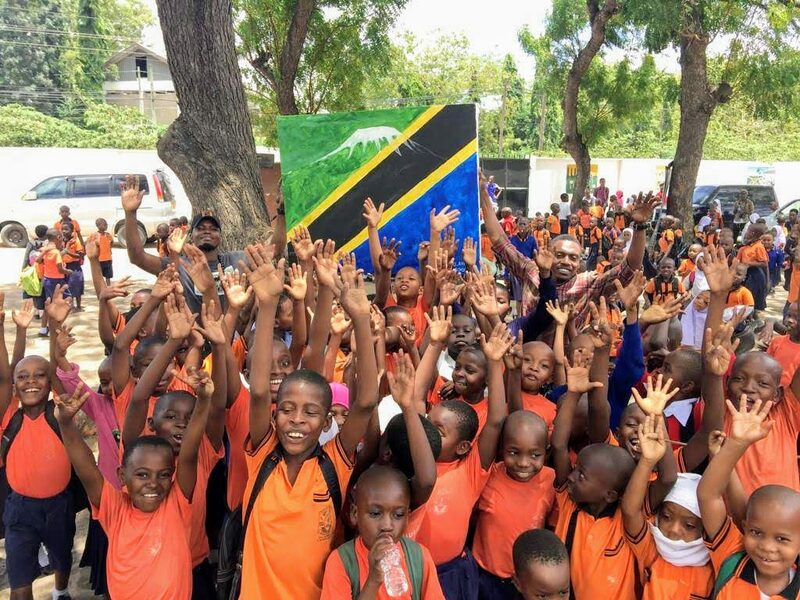 The event gradually wound down with one more song, structured around the colors of the flag they held aloft and that was left to staff and children of Mgulani by Nafasi as a present. Arriving at our second outreach, we were greeted with a surprise. 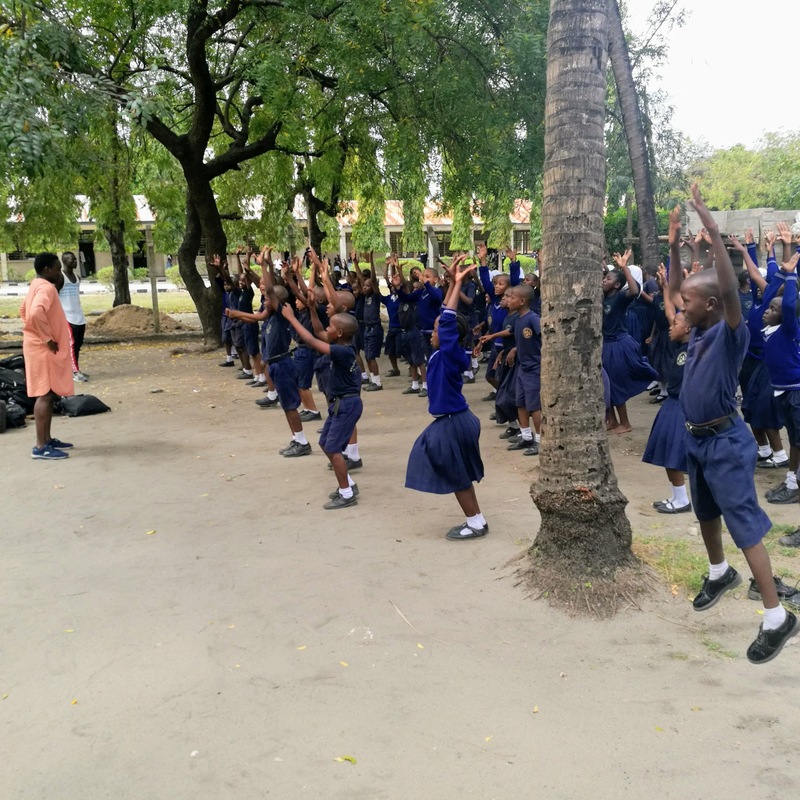 The head teacher, the thin, and sharply attired, noted our slight lateness as a matter of course, as would a man used to making up for others shortcomings, and led us to art the teacher who gathered the students beneath the combined shade of three mango trees in a corner of the ground. They sat side by side with legs crossed on the the sand, divided into years, with oldest students waiting conspicuously in a corner. Once everyone was settled we were officially welcomed, with all of us given a chance to introduce themselves in the call and response manner were mastering more and more as the day progressed. Our surprise began discreetly, with the six or seven students in the corner moving shyly into the center. They transformed after spreading out and taking their places, launching into an effervescent anthology of city stories; improvised pieces featuring angry landlords, lazy husbands, unpredictable wives and wayward students performed with precocious wit and uncanny generosity for some of life’s darkest corners. Inspired, we channeled their energy into our activities; leading each of the activities with an enthusiasm and openness that, multiplied and reflected, carried us through the remaining day. It was the perfect end Art-reaches each of which had been pleasingly unpredictable and indelibly satisfying. All that remained now, after a month of taking art all over town, was to return home for the big festival.